MINNEAPOLIS (AP) Home sweet home for the Minnesota Timberwolves – again. 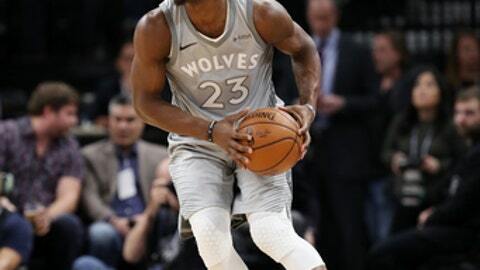 Jimmy Butler scored 28 points, Karl-Anthony Towns had 24 points and 11 rebounds for his NBA-best 46th double-double, and the Timberwolves beat the Milwaukee Bucks 108-89 on Thursday night. Jeff Teague added nine points and eight assists for Minnesota, which was coming off consecutive losses at Atlanta and Toronto. The Timberwolves have lost six of their last seven road games and have returned home with back-to-back losses from their last three road trips. Each time, Minnesota has responded at home with a victory, winning by an average of 14.25 points. The Timberwolves’ 21-6 home record represents the second-most home wins in the NBA behind San Antonio’s 22. Khris Middleton scored 21 points for Milwaukee, which had won four in a row. Giannis Antetokounmpo had 17 points and 15 rebounds, but the Bucks shot 37.6 percent from the field and committed 15 turnovers. In the first meeting between the two teams, Milwaukee erased a 20-point deficit in the third quarter for a 102-96 home win. Bucks: PG Eric Bledsoe was held out with a sore left ankle after he got hurt in the team’s previous game. … Xavier Munford was active and played his second game of the season with the team short at guard. Timberwolves: The 39 points allowed in the first half was the second-lowest Minnesota has given up in the first half this season. .. Jamal Crawford converted the 54th four-point play of his career in the second quarter, extending his NBA record in the category. … After being outscored in the paint by 30 points in the loss at Milwaukee, the Wolves held a 50-42 advantage in the paint on Thursday. Malcolm Brogdon, who started in place of Bledsoe, left in the second quarter with a left quad tendon strain. Brogdon went down after a dunk and had to be helped off the floor. Prunty didn’t have an update on Brogdon after the game. Antetokounmpo told the Milwaukee Journal-Sentinel that he twisted his left ankle in the fourth quarter and was having trouble putting weight on it, but he didn’t address the injury with a small group of reporters after the game. New England Patriots coach Bill Belichick was in attendance, taking a bit of leisure time as he prepares for Sunday’s Super Bowl across town against the Philadelphia Eagles. Belichick and Wolves coach Tom Thibodeau are friends dating to Thibodeau’s time as an assistant coach with the Boston Celtics. Thibodeau, who grew up in Connecticut, is a Patriots fan. Super Bowl events have brought many athletes and celebrities to town. Boxer Floyd Mayweather, Pittsburgh Steelers receiver Antonio Brown, Rapper Gucci Mane and hip-hop duo Rae Sremmrud were also spotted. Rapper Lil Jon performed at halftime. Bucks: Host the New York Knicks on Friday. Timberwolves: Host New Orleans on Saturday.